Yellow Screen on iPhone X? Here's a Fix! Yellow Screen on iPhone X? Here’s a Fix! If you are unsure as to why your iPhone X screen looks a little yellow, then this article is just the right fix. Since iPhone X is the first iPhone with OLED display, it is logical to feel furious when the screen shows discoloration. In this article, you will get a detail information on why your screen turns yellow and how to fix a yellow screen on iPhone X and other models easily. 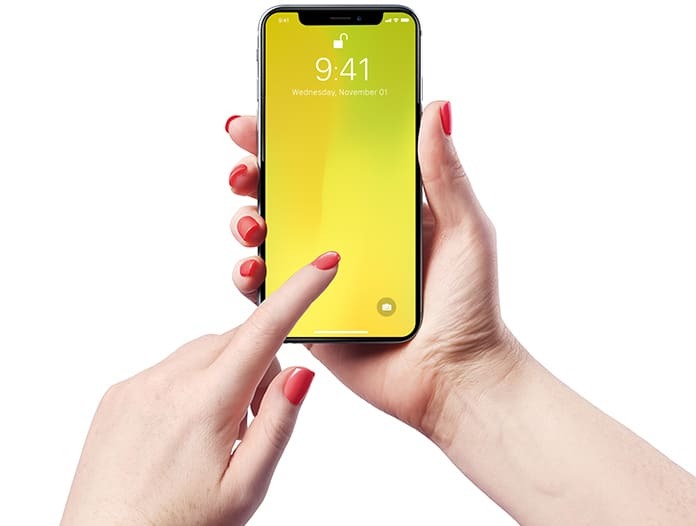 Yellow Screen on iPhone X – Why Does iPhone X Screen Look Yellow? You might have turned on the True Tone Display. Night mode is switched on. You might have opted for the wrong color filters. Now that you know the reason behind a discolored screen, here is how to diagnose and fix the real reason. One of the most common reasons for a discolored iPhone X is because the True Tone is turned on. This new feature is available on the latest versions of iPhone only. True Tone is designed to detect ambient light and matches the intensity and color of the light on your display. Since during the day there is more yellowish ambient light, the display appears to be more discolored. Open the Settings app on your iPhone X. Turn off the switch next to True Tone. When the switch is white and positioned to the left, you will know that it is turned off. 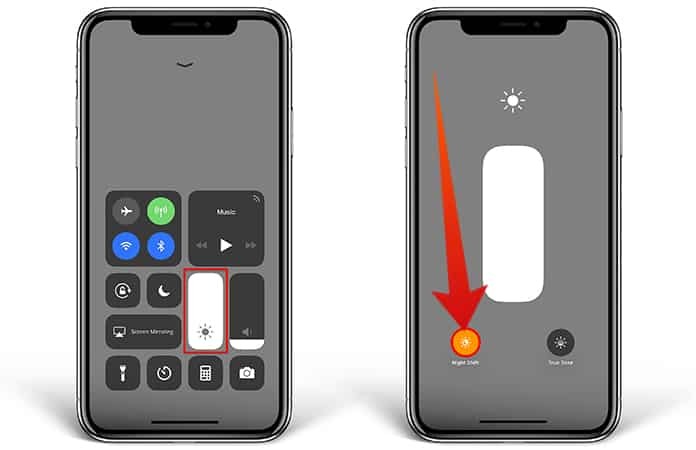 Disable true tone option on your iPhone X. Open Control Center by swiping downward from above the upper right-hand corner of the exhibit. Press and hold (3D Touch) the vertical display brightness slider. Tap the True Tone button to turn it off. When the icon is white inside of a dark gray circle, the true tone will be turned off. Disable true tone option from the control center. Before the True Tone display was introduced by Apple, the most common reason for this yellow screen on iPhone X and other iPhones running iOS 11 is because of the Night shift mode. 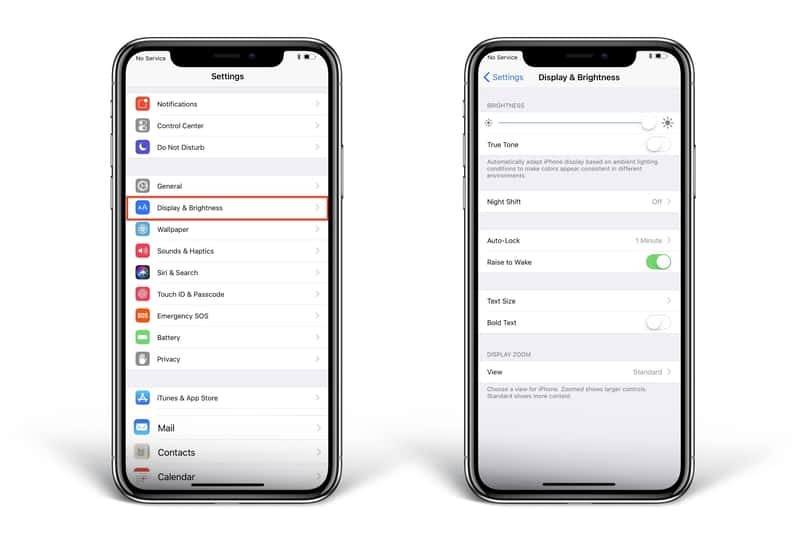 Night shift is a feature that adjusts the colors of your phone’s display to make it warmer which helps you to sleep after using your phone at night. Swipe down from above the upper right-hand corner of the screen to open Control Center. Press and hold (3D Touch) the brightness slider. Tap the Night Shift button to turn it off. You’ll know Night Shift is off when the icon is white inside a dark gray circle. Disable night shift option from the control center. 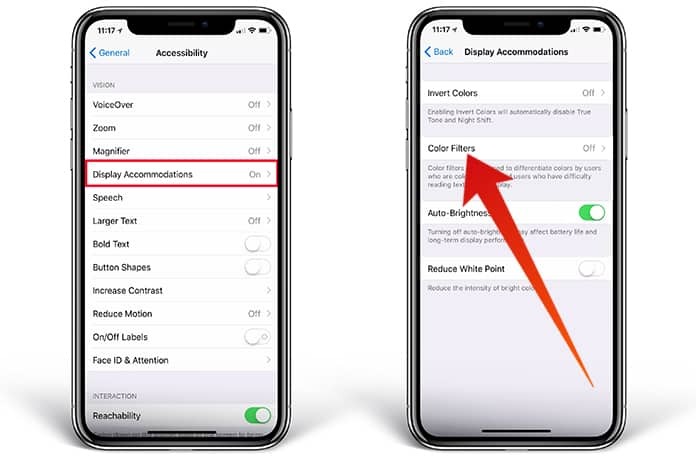 So if you have tried both the options of Night Shift and True Tone, then the possible reason for discolored screen is the Color Filters on your iPhone X. Color Filters are intended to assist people who are colorblind or who have complexity IN reading text on the screen. 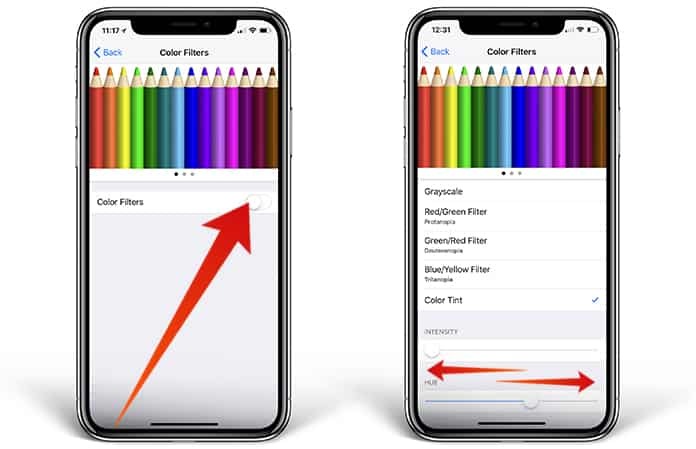 The yellow screen on iPhone X and other iPhone models can be fixed by tweaking the color filters on your device. To change the Color Filters open the Settings app and tap General -> Accessibility -> Display Accommodations -> Color Filters. To start using Color Filters, turn on the switch next to Color Filters, when it turns green, you are good to go. Once you have turned on the Color Filters, you can start using different filters that can help you adjust your screen display and reduce the yellow discoloration. You can even select a Hue slider that has less yellow tone and the intensity slider to make sure that the hue isn’t too strong. Altering the tint of your iPhone X’s display isn’t possible in the first time and may require some tries. Be patient and chose a Hue that fits your screen best. 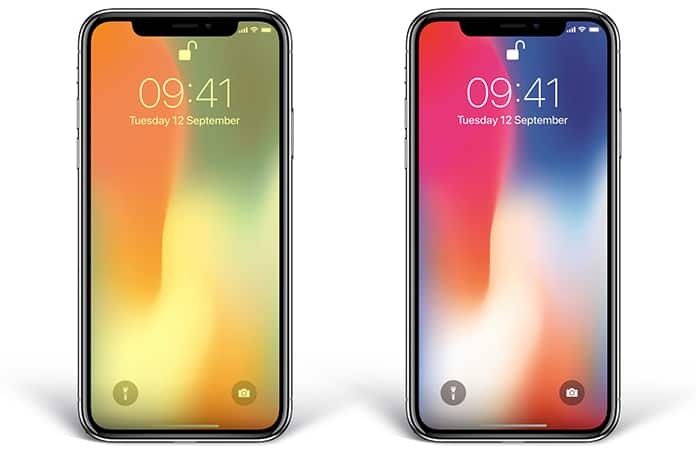 If none of the above methods helped you then there is a high chance that your iPhone X have had a hardware problem or has a manufacturing defect. If your iPhone X has been exposed to water or has hit a hard surface then there it is very likable that the internal components are damaged making the screen appear yellowish. If you have an Apple Care coverage then take your iPhone to the nearest Apple Store and have it inspected. Make sure you schedule an appointment first so that when you go there you have someone to assist you. If in rush, you can go to an on-demand repair company. 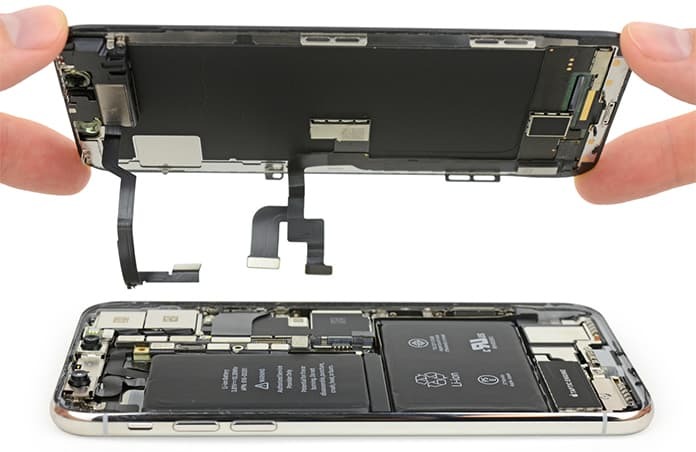 The company would send you certified technician who can repair your iPhone X there and then. iPhone X Screen not Yellow Anymore? Your iPhone X is now looking just fine. Share this article as much as you can and help your peers get rid of their screen’s discoloration.